The NASCAR Pinty's Series is going on its annual Western Canada tour this week and drivers and teams will be tested to the limits with three races in four days. The Western swing could be a deciding factor in the hotly contested driver championship chase. On the first stop at the Wyant Group Raceway on Wednesday, July 26, Alex Tagliani will have two occasions to score his first win in Saskatoon with a pair of 100-lap features for the Velocity Prairie Thunder Twin 100s presented by Bayer. Qualifying for the first race will be held in the afternoon, but the grid for the second race will be set by each driver's fastest lap in the opening 100-lap race. Each Saskatoon race will score full championship points. The two 100-lap sprint races will be held in the evening on the 0.333-mile oval track and drivers will have to be daring as well as cautious because teams will only have a two hour and thirty minute break between races to repair if there was a major incident. Then, three days later on Saturday night, drivers will compete in Round 8 at Edmonton International Raceway for a 300-lap race on the quarter-mile oval. "With two races on the same night, everything will be of the utmost importance in the first one in Saskatoon," Tagliani said. "I must make sure to save the car in order to be competitive for the second Wednesday night 100-lap sprint. The other thing we must be on the lookout for is the car set up. If we make the wrong choice for the first event, the team will not have the time to make major modifications for the second race. "To come out of the Western swing with maximum points, Tagliani Autosport's strategy must be nearly perfect from the get-go if we want to be among the frontrunners in Edmonton. Between Wednesday evening's twin bill in Saskatchewan, and Saturday's race in Edmonton, nobody will have free time because of commitments. We have to travel from one province to the next and furthermore, we have a full day with our Lowe's sponsor on Friday. If we encounter a major problem with the EpiPen-Lowe's-St Hubert Dodge in Saskatoon, we may not be competitive in Edmonton. Bad luck could be devastating in our run for the championship," concluded the Canadian Motorsport Hall of Fame member. This will be Tagliani's fourth and fifth start in Saskatoon. In his three previous starts, he finished twice in the top five and three times in the top 10. Overall, Tagliani has five wins, eight poles, 19 top-fives and 31 top-ten finishes in 50 NASCAR Pinty's Series starts. In the driver standings, Tagliani is eighth overall with 179 points, only nine points behind fifth place held by Andrew Ranger. Kevin Lacroix sits in first place with 222, 13 more than Alex Labbé. Also committed to the Asian FRD LMP3 Series with Craft-Bamboo Racing, Tagliani will cede, due to a conflict with his NASCAR schedule, his Ligier JS P3 ride to Italian driver Marco Bonanomi for round 2 of the double header contested next weekend at the Shanghai International Circuit in China. Tagliani will return to the #20 Ligier for round 3 on August 30. The Western tour is also very important for sponsors of Tagliani Autosport. Fans in Saskatchewan who wish to meet Tagliani in Saskatoon can join Alex and the team as they stop by the RONA Home Store at 1722 Preston Avenue North in Saskatoon on Tuesday July 25 from 4 p.m. to 8 p.m. 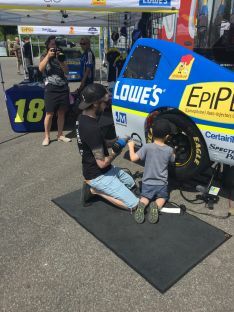 The team will be on hand for a promotional visit with the #18 EpiPen-Lowe's-St Hubert-Premium Spectra racecar, Tagliani Autosport transporter and crew. Fans are invited to enter pit stop competitions and join Alex for autograph sessions and photo ops. On Tuesday morning, Tagliani will be on a media tour in Saskatoon to talk about his racing season and the interactive online Food Allergy Canada's Drive the Discussion Contest at the foodallergycanada.ca/tag. 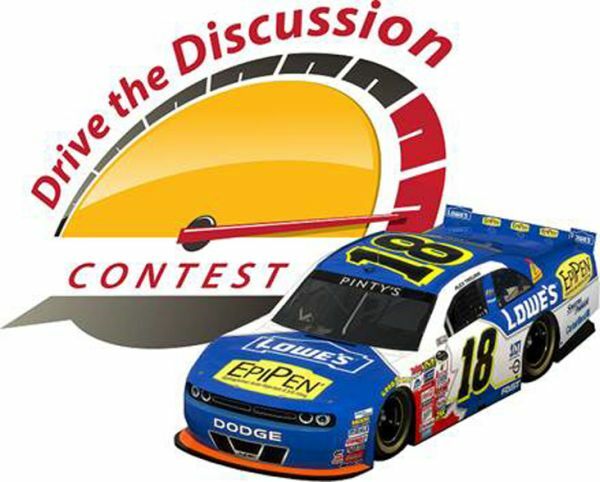 Everyone can join the food allergy conversation in the Drive the Discussion Contest by posting his favourite food allergy tip on how to safely manage food allergies that can be shared with others. Each post qualifies them for a chance to win one of five weekly prizes and/or a grand prize from Lowe's/RONA. Don't forget to share your tip with a friend - if they comment on your tip, then they will be eligible to win: go to foodallergycanada.ca /tag.